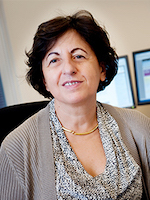 Professor Elisa Bertino joined Purdue in January 2004 as professor in Computer Science and research director at CERIAS. Her research interests cover many areas in the fields of information security and database systems. Her research combines both theoretical and practical aspects, addressing applications on a number of domains, such as medicine and humanities. Current research includes: access control systems, secure publishing techniques and secure broadcast for XML data; advanced RBAC models and foundations of access control models; trust negotiation languages and privacy; data mining and security; multi-strategy filtering systems for Web pages and sites; security for grid computing systems; integration of virtual reality techniques and databases; and geographical information systems and spatial databases. R. Nehme, E. Rundensteiner, E. Bertino, "Tagging Stream Data for Rich Real-Time Services", Proceedings of the 35th International Conference on VeryLarge Databases (VLDB 2009), Lyon (France), August 24-28, 2009.